Although currently living in exile in Central New Jersey, Joe Giacoio was actually born and raised in the Bronx. His writing has been described as "somehow simultaneously quirky and classic" and touches upon topics that range from debating the existence of God to the existence of Elvis. His 'two-handed' guitar style draws from influences from the New Acoustic genre and artists such as Michael Hedges and Preston Reed. Joe has given workshops on guitar technique and acoustic guitar electronics, and took second prize at the 1995 Chicory House Fingerpicking Contest. 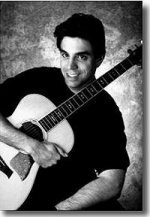 Joe hosted the Guitar Styles workshops at the 1995 and 1996 Falcon Ridge Folk Festivals. He has shared the stage with artists such as Susan Werner, David Roth, Bill Staines, Greg Greenway, David Massengill, Pete & Maura Kennedy, and Vance Gilbert. Joe has appeared at such venues as: The Fast Folk Cafe, the Treestar and The Uptown in New York; Mine Street and The Minstrel Coffeehouse in New Jersey; and The Chicory House and Godfrey Daniels in Pennsylvania. In 1996, Joe was selected to participate in the Washington DC-area MACFUMP (Mid-Atlantic Coalition of Folk Music Presenters) New Talent Showcase. And in 1998 he has been selected as a showcase artist for the New Jersey Folk Festival. Every year, Joe produces "Kerrville Rejection Night," a benefit for World Hunger Year. At this show, New York area songwriters perform the songs that they have submitted to the Kerrville Folk Festival's New Folk Contest, with all proceeds going to WHY, the charity organization founded by the late singer Harry Chapin.